Legend has it that a slow moving space ship crashed into a Texas windmill on April 17 1897, exploding into thousands of pieces. As the debris was searched through, the body of a small alien was apparently discovered and buried in the local cemetery. The wreck also revealed material sketched with a type of hieroglyphic never seen on Earth before. Then years later, in 1973, a ninety-one-year-old who had been a local teenager at the time of the reported incident came forward to back up the burial story. She said her parents had actually been to the crash site, but had not allowed her to accompany them for fear of what might be in the debris. The supposed ‘crash’ became such a well-known story that it was transformed into a movie, “The Aurora Encounter” in 1986, starring Jack Elam. Widely referred to as the “Welsh Roswell” this incident on January 23 1974 is etched into the extra-terrestrial history books. In Berwyn Mountains in Llandrillo, North Wales, a UFO craft was believed to have smashed into the hills, scattering the remains of non-human bodies. The area was reportedly cordoned off by the military and ‘Men In Black’ style strangers while wreckage was recovered. The bodies were said to have been discovered by Welsh police and that the British Government covered up the event. Many experts claim an earthquake occurred, but there were no craters to back up their opinions. Spain experienced its first major alleged UFO crash on the morning of January 18 1994. Witnesses saw a huge sparking fireball – the size of a ‘full moon’ – in the sky over their village. Later, a 200m gouge in a nearby hillside close was found, with trees displaced down the hill. Opinions are divided about the causes of the explosion. Some feel the incident might have been a blast of underground gases that vented into the air after the topsoil was removed. Local residents, however, claim it was a UFO – creating conspiracy theories all over the country about alien activity. Passed down by word of mouth, and legends of mysterious letters sent by ex-government officials, the UFO story of Coyame began on the evening of August 25 1974. US Air Defence radar detected a UFO heading for American airspace from the Gulf of Mexico. But moments later it collided with a small civilian airplane and disappeared from radar. The Mexican government is alleged to have sent a team to recover the plane after hearing about the crash – with spooky consequences. US military personnel in Texas were monitoring radio traffic when the Mexicans suggested they had also recovered a shiny, silvery disk. But things are said to have got even weirder as they returned to the base when they all dropped dead from unknown causes. UFO researchers believe the soldiers were exposed to a lethal biological or chemical substance emanating from the crashed craft. They say when US satellite surveillance and jet flyovers showed that the Mexicans had died, their recovery teams went in, recovered the ship and took the object back into the States. Dalnegorsk, Primorsky Krai in the USSR, is the next setting for another mysterious story. The inhabitants of the town noticed a reddish ball just over a hill called Height 611 at around 8 PM. Eye-witnesses said it was about the size of a half of the moon’s disc and that it made no sound as it fell. Others described it as a hovering ball showing lights of varying intensity. Three days after the incident, a group of ufologists climbed the hill. They discovered a landing patch that looked like it had been sizzled by high temperatures and was 2x2m in size. The nearby rocks were covered with a black film and remains of a burnt tree were found. Some of the rocks had drops of silvery metal, which were later determined to be a mystery type of lead not found in the area. On December 9 1965 at Pennsylvania, USA screams of ‘UFO; filled the air, as a large fireball was seen by thousands. Eyewitnesses in Pittsburgh claimed something crashed in the woods. A boy in the village said he saw an object fall and blue smoke bellowing from the trees and alerted authorities. A local fireman came to assist and reported an object in the shape of an acorn “as large as a Volkswagen Beetle” with writing resembling Egyptian hieroglyphics in a band around the base. While the US military claimed they searched the woods and found ‘absolutely nothing’, locals suggest they cordoned off the area and removed the ‘spaceship’. Rendlesham Forest in Suffolk is perhaps the most famous setting for a UFO event in Britain. It gained a high profile because of its military witnesses because it was located between the twin bases of RAF Bentwaters and Woodbridge. Around 3am on December 26 1980 a strange craft was spotted by a security patrol. When security men entered the forest they saw strange lights moving through the trees and a huge, bright light. Some of them claim to have seen a metallic object, suspended in a yellow mist, hovering over a clearing in the trees, with a pulsating blue and red circle of light above. One eyewitness claims to have seen triangular landing gear on the object leaving three impressions in the ground that were visible the next day. The servicemen further suggest that the object seemed to move away from them as they approached, and they followed it out into a field. Some reports say that local farmyard animals had been behaving in a state of fear and panic too. The men were allegedly threatened by officials after the event and ordered to sign documents that vowed silence. Days later further flashing and star-like lights were seen across the field to the east, almost in line with a farmhouse. It has been rumoured that small beings with domed heads left the craft. In July 1947, local authorities in New Mexico revealed that the 509th Bomb Group had recovered a flying disc and debris near the small town of Roswell. The government claimed it was simply a weather balloon and the event was quickly forgotten. Major Jesse Marcel, who was involved with the original incident. He believed the military had covered up the recovery on an alien spacecraft. Additional witnesses and reports emerged over the following years. They added significant new details, including claims of a large military operation dedicated to recovering alien craft and aliens themselves at as many as 11 crash sites as well as alleged witness intimidation. 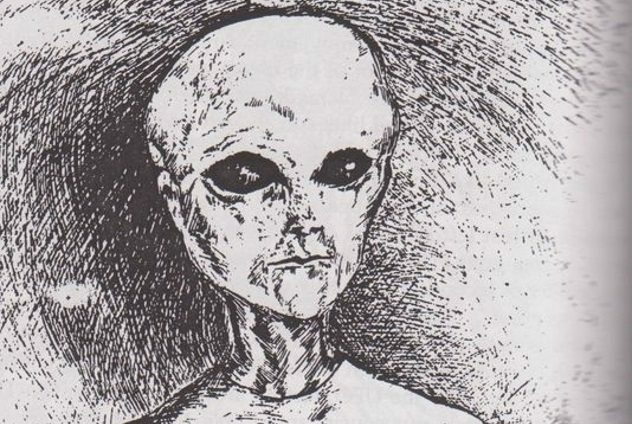 In 1989, former mortician Glenn Dennis put forth a detailed personal account, wherein he claimed that alien autopsies were carried out at the Roswell base. This incident’s name may induce sniggers – but it certainly gave Canadian locals the willies at the time. On October 4 1967, something crashed into the waters on Nova Scotia’s South Shore. One key witness was Laurie Wickens, a local resident, who was driving with four friends along Shag Harbour Highway 3 at the time. He told how he spotted a large object descending into the waters of the harbour with bright lights. A military operation to recover the aircraft failed to find any conclusive remains though conspiracy theories maintain that they saw divers emerging from the water with UFO debris. This spooky explosion occurred near the Podkamennaya Tunguska in Russia, on June 30 1908. Locals observed a huge fireball that flashed and lit the skies, followed by a shock wave that knocked people off their feet and broke windows 400 miles away. The explosion registered on seismic stations across Eurasia and produced huge fluctuations in atmospheric pressure. Neither craters nor meteoric debris have been discovered from this incident so far, leaving most scientists.